Mark O’Brien, the baseball coach at Santa Clara University, was only being polite when he invited Daniel Nava to come out for his team as a walk-on in the fall of 2001. Nava weighed 135 pounds and did not get many at-bats during his senior year at St. Francis High in nearby Mountain View, Calif. He played well in center field, but the coaches often would use a designated hitter for him. O’Brien was a graduate of St. Francis and knew Nava from the summer camps at Stanford when he was an assistant there. Nava became a batboy for the Cardinal and when he was ready for college, O’Brien gave him the opportunity at Santa Clara as a favor. But O’Brien was willing to let Nava hang around the program. What he could offer was a chance to shag balls during batting practice, rake the field and wash the uniforms on road trips. The former team manager is now 4 for 8 with 2 doubles, a grand slam, and 5 RBIs as a member of the Red Sox, arriving on Saturday and starting two games in left field. There is not a more unlikely rookie in all of baseball than the 27-year-old Nava. Wearing a Santa Clara polo shirt, O’Brien took a recruiting trip to Florida on Sunday night. As he made his way down the aisle of the plane, people asked if he knew Nava. Nava stuck around the Santa Clara program for two seasons. O’Brien considered activating him as a sophomore when an unexpected growth spurt left Nava 5 feet 10 inches and 170 pounds. A pipsqueak no longer, Nava was driving the ball to all fields. But for financial reasons, Nava had to leave school and enrolled at San Mateo Junior College. That’s when Nava emerged. He hit .400 in two seasons and returned to Santa Clara, this time on a scholarship. Nava hit .395 with a .495 on-base percentage as a senior. Calls came, but no contracts were offered. Nava tried out for the independent Chico Outlaws and was cut. He made the team the following season and was the Golden League MVP. Baseball America magazine named Nava the best prospect in the independent leagues. That caught the attention of Red Sox assistant director of pro scouting Jared Porter, who recommended that Nava’s rights be purchased from Chico. The high-stakes deal: $1 up front with an additional $1,499 if Nava made it through spring training in 2008. 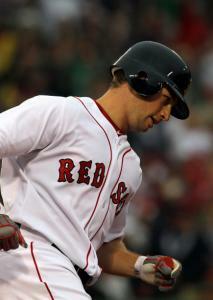 Nava soared through the organization, advancing a level each season before being called up Saturday. He came to the plate with the bases loaded in the second inning and hit the first pitch he saw from Joe Blanton into the Red Sox bullpen. The veteran players on the roster took little notice of Nava’s arrival and few know his story. As of Sunday, there wasn’t even a nameplate above his locker. But in Pawtucket, Portland, and the other minor league outposts, where coaches and players go about their business with little fanfare, Nava’s ascension to the majors was cheered. “It’s a good story for everybody in baseball,’’ Sox player development director Mike Hazen said. “It’s not accurate, but there’s a pervasive feeling among players that some guys get opportunities based on their signing bonus. This is somebody who didn’t get a signing bonus. Getting to the majors, as difficult as it was, will be easier than staying there for Nava. Left fielder Jeremy Hermida (ribs) is expected to come off the disabled list later this month, and the hope is that Jacoby Ellsbury (ribs) will return after the All-Star break. The odds are against Nava staying with the Red Sox. But the odds have never been in his favor. O’Brien believes Nava’s approach at the plate will make an impression on the Red Sox. Like other teams along the way, they’ll learn that the guy with no chance can hit. “Those pitchers and the scouts will look for weaknesses. I know at that level it’s sophisticated,’’ O’Brien said. “But Daniel uses the whole field, he’s disciplined in terms of what he’ll swing at and he has good balance. The immediate goal is to be playing for the Red Sox when they arrive in San Francisco for an interleague series with the Giants starting June 25. Nava’s hometown and college are about 45 minutes away from AT&T Park. “We’re all Giants fans around here,’’ O’Brien said. “But Daniel will have a lot of fans in the stands. That’s going to be a big day for a lot of us.